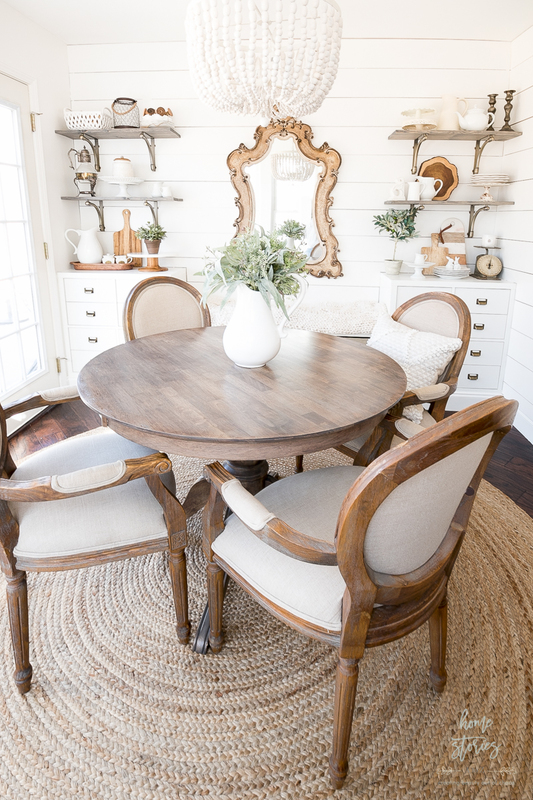 Our informal dining room, affectionately referred to as the breakfast room, received a much-needed makeover. 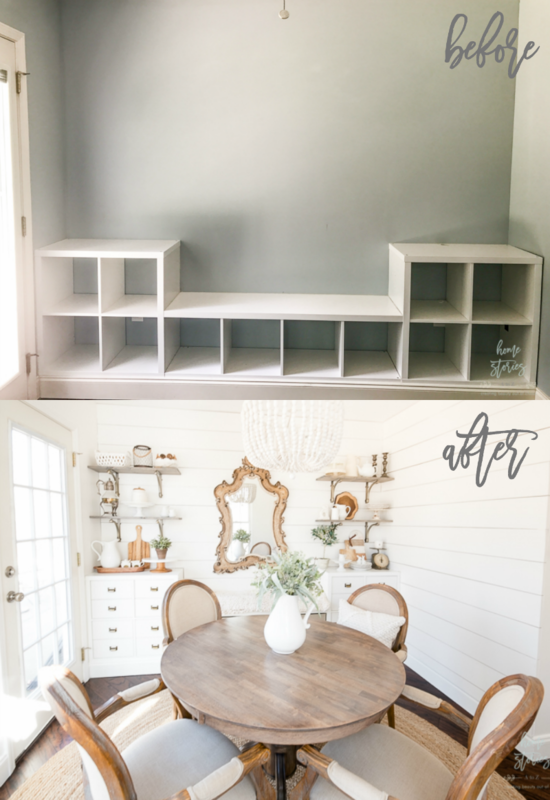 Come see how I transformed cube shelving and a blank wall into a fantastic storage display! This post is sponsored by Better Homes & Gardens at Walmart. As always, all opinions on the adorable products are 100% my own. Affiliate links are used to source all online products. You can find the complete source list for everything used in the link at the end of the post. 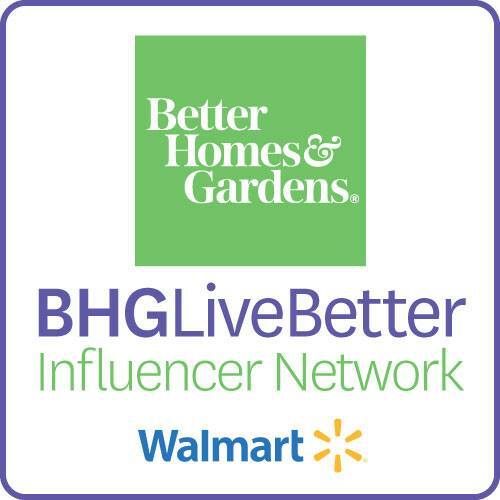 As a Better Homes & Gardens Influencer, I am tasked with a monthly challenge to utilize Better Homes & Gardens at Walmart products creatively within the home. Sound like fun? It is! This month’s challenge focused on getting organized in the new year. Oh boy. If you are anything like me, then the only problem with this task is deciding which room to tackle first and where to even begin! I have so many spaces in the new home begging for better organization, but our breakfast room was screaming the loudest for a makeover. The Collapsible Fabric Storage Cubes in Linen Ivory could not be more perfect! They match my linen chairs beautifully and pull out like drawers. As you can see, I still need to label all of the drawers. My handwriting is atrocious, so I’m actually waiting to find the box containing my letter stamps! The drawers in the two square cube units are from another store known for their cube storage *wink* and work perfectly with the Better Homes & Gardens cube storage units. I replaced the hardware on the drawer fronts to give them a more custom look. I still need a cushion for the top of the bench, but Eowyn doesn’t seem to mind my makeshift cushion one bit! 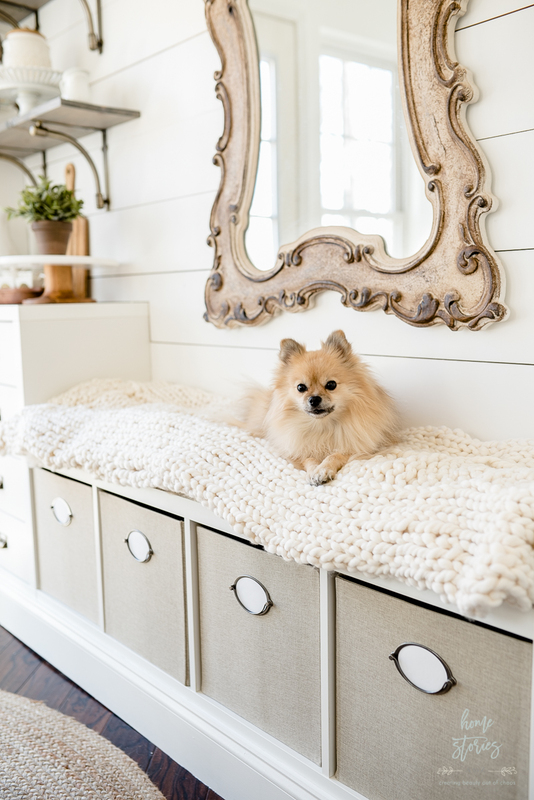  In typical Pomeranian fashion, she made herself right at home as soon as I placed a luxurious throw on the bench. 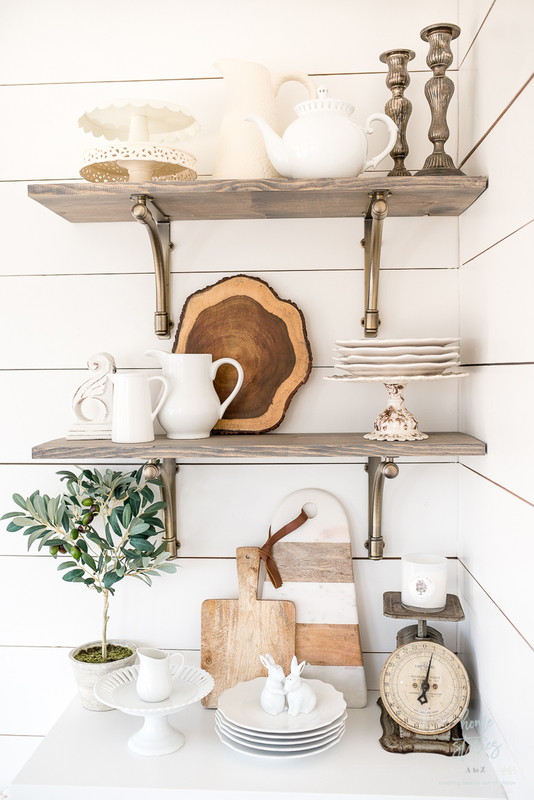 Our previous kitchen had some makeshift open shelving that I loved to style and was really missing. Therefore, I added these open shelves using brackets and a stained 1x10x10 board cut into four equal lengths. 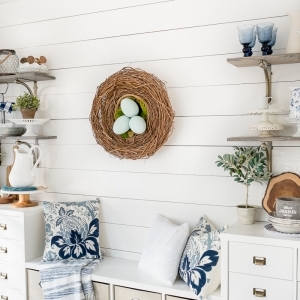 The chicken wire lantern, acacia paddle board, and marble cake stand are all from Better Homes & Gardens at Walmart. The other accessories are items I’ve collected over time from thrift stores or home stores. My beautiful new shiplap walls were my Christmas present from my husband! He installed the shiplap and I did everything else in the room. Matt strongly dislikes to do any DIY, so I’m always hesitant to ask for his help. I wanted to use real wood in here instead of MDF and I wanted long, uncut planks without any seams. Ten foot boards are too heavy for me to install without help so I sheepishly asked Matt if he’d gift them to me for Christmas. He wasn’t thrilled with the request, but as always he did a beautiful job! The room is just shy of 10 feet long, so we used 1x8x10 boards with spacers to achieve the look I wanted. It’s so wonderful to have more storage space and a place to display my dishware! I didn’t buy anything to place on the shelves. My poor kitchen cabinets and attic were holding plenty already. 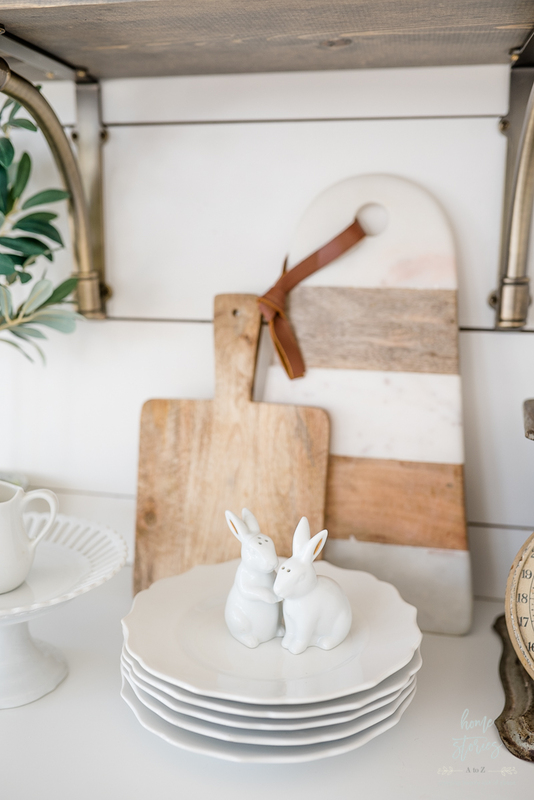 The cute wood bark charger is from Better Homes & Gardens at Walmart and can be found here. I’m looking forward to changing the look of the shelves with the seasons and switching things around when the fancy strikes! 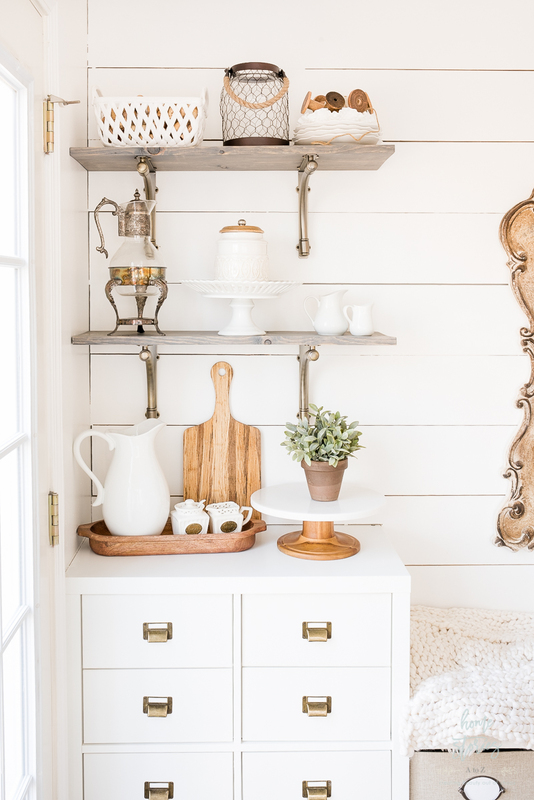 I love to style shelves and have written several posts on how to style shelves here, here, here, and here. 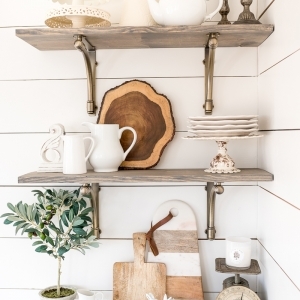 Click on any of the “here’s” to read the tutorials and tips on how to style shelves like a pro! In case you’re wondering, because I’m certain someone may ask, I’m using our new breakfast room cube storage to store a bunch of craft supplies and kitchen accessories. My boys do homework at this table, or at the kitchen bar and are often in need of markers, colored pencils, glue sticks, note cards, etc. The drawers and storage bins are fantastic for keeping their craft supplies organized yet handy. With much less closet space available in this home compared to our last (and no basement! ), I’ve really struggled with organizing my surplus accessories. 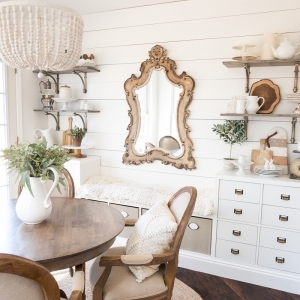 The drawers are amazing for stashing away extra placemats, cloth napkins, and silverware sets. And just a few more pictures because I’m obsessed with this space and can’t seem to ever edit down my pictures to a socially acceptable number!  Indulge me. Getting organized is hard work! For a complete list of room sources, please click here to be taken to the breakfast room source page. 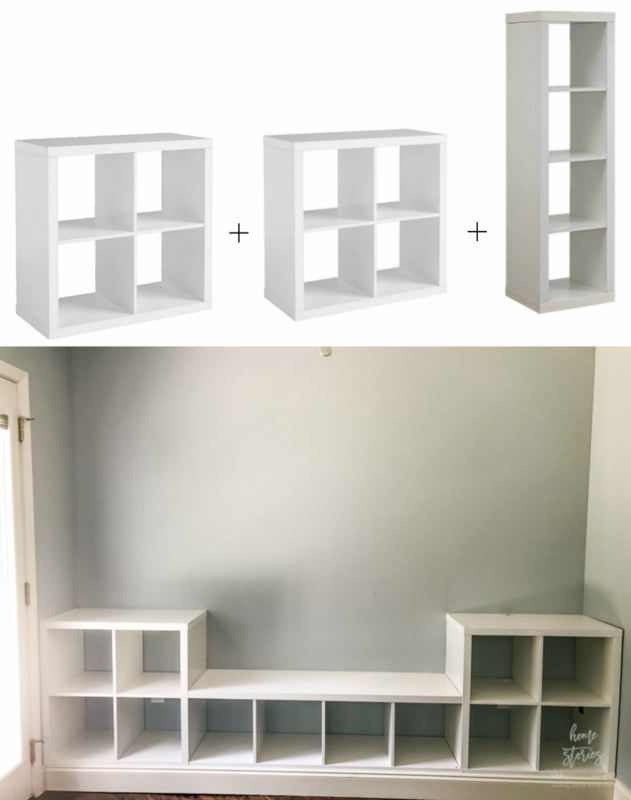 I love your transformation with the BHG cubes, I decided to do the same in my grandkid’s room but the drawers are not fitting into the cubes .Did you have to modify them at all? Hi Cheri, thanks so much! No, I didn’t have to modify them at all to fit. The interior of the cubes should be around 13×13. Hi! 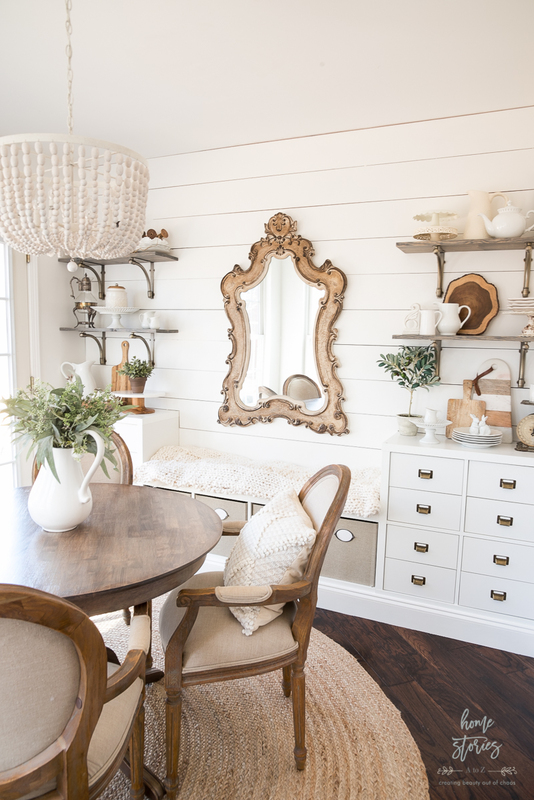 I’m obsessed with your room – it’s stunning! Where did you get that jute rug from? It’s exactly what I’m looking for! 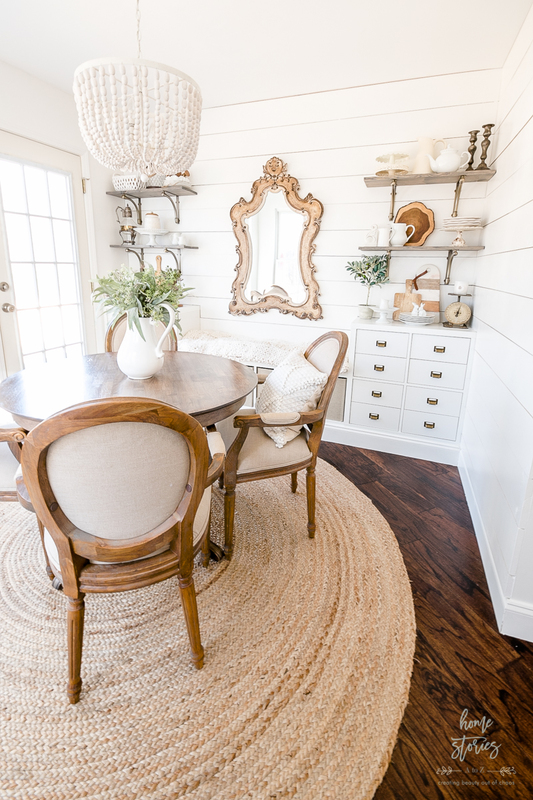 I too have been searching for a cund jute rug…it looks fabulous!! where did you find it? Thanks!! Very Pretty!! I was wondering how you attached the central bench to the units on the sides? It looks like you did not use the end pieces for the unit used as a bench. Thanks! The sides of the bench were just omitted due to the length of the room. It wouldn’t fit otherwise. Wood screws were used at an angle to attach the bench to the sides of the bookcase. Hello! Love this. Curious if you had to paint the cube storage units or the drawer inserts you used to make everything match or are they untouched. Thanks!! I did think about painting them but left them untouched. The drawer inserts look a tiny bit more of gray/dull than the cube units but honestly I’m probably the only one who would notice. Beth, Where did you find the oval cube label frames/pulls? Thank you! Those pulls on the BHG fabric bins come on the bins and can be found here: http://rstyle.me/n/cwjgs7n7aw There are several bin styles under this link and this one is the linen bin. This is so inspiring!! I just love it! For the cubes within the cubes — did you install drawer hardware, or are they just sort of pull-out boxes? Oh my goodness, Beth! You have inspired me to tackle our office to give it a complete organizational rehaul! I would never have thought to use those cubes in such a beautiful way. Thanks for that very thorough source list as well. You are so very talented! Wow Beth, Nice job. A good way to get storage without breaking the bank. It’s beautiful. I absolutely love what you’ve done in this room! It’s beautiful and so creatively done! Great job on the storage and display wall. It totally looks custom made from top to bottom. 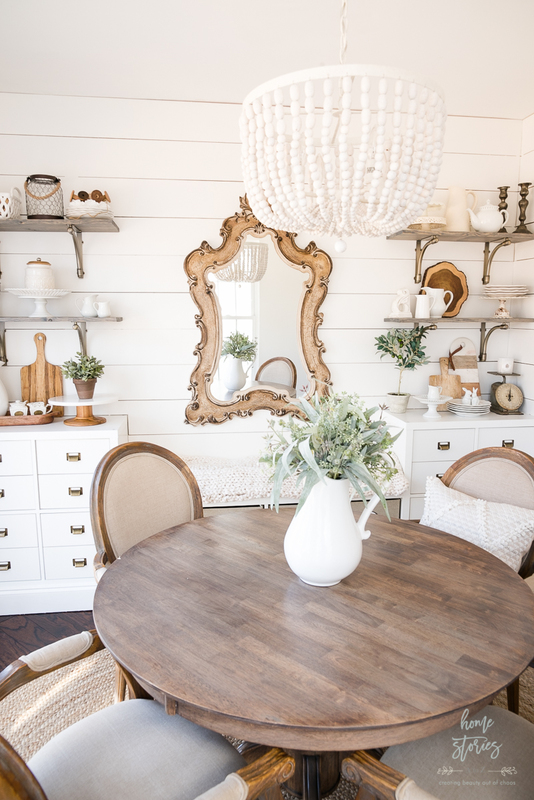 I love the shiplap wall as a backdrop. I love how you upgraded the interior shelves with the library drawer pulls. Wish I could stop by and put my new calligraphy skills to use for your labels! Ha! Me too! Thanks friend. Nicely done Beth and love the idea of the cubes!!!! Beth!! This is amazing! I love every detail. And where did you get that mirror from? What a yummy space, Beth! You definitely did an upscale on those BHG cube units – course a little Pom action upgrades anything! Beth, this looks amazing! I could not be more impressed! Brava! You always amaze!! This is beautiful! Oh my word, this is gorgeous. I love it. What a fabulous addition. Beautifully done! Where are the brackets from and what color stain did you use? Thank you! You can find all of the sources for the room linked and listed here: https://www.homestoriesatoz.com/breakfast-room-source-page The brackets are from Lowe’s and I used Minwax Classic Gray stain. It looks really great. 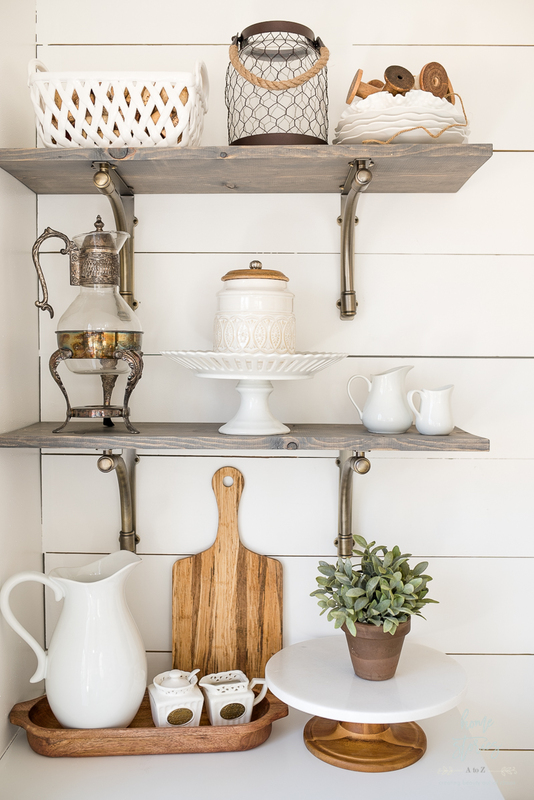 The shiplap adds texture and a finished look to the wall. Love those brackets from Lowe’s. Storage and organization done in a beautiful way. Thanks so much for stopping by and taking the time to comment Sharon! Absolutely beautiful! love the mirror as well.